TMH becomes first healthcare system in North Florida to provide patients with interactive mobile maps and access to medical services via their smartphones. Tallahassee, Fla. (April 3, 2019) – Tallahassee Memorial HealthCare (TMH) has selected Atlanta-based Gozio Health to develop a robust mobile wayfinding platform for patients and visitors. 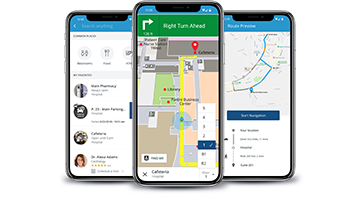 The experiential wayfinding app will provide users with interactive maps and step-by-step navigation to doctor’s offices, cafeterias, pharmacies, nearby restrooms, parking decks and other points of interest within the TMH health system. “Serving a 17-county region in North Florida and South Georgia, TMH chose mobile wayfinding to improve the overall patient experience of our extensive network and guide patients directly to their point of care,” said Stephanie Derzypolski, Vice President/Chief Communications Officer at Tallahassee Memorial HealthCare. “As we continue to expand Gozio’s services to hospitals across the country, we are pleased to partner with Tallahassee Memorial HealthCare, the first healthcare system in North Florida to adopt experiential mobile wayfinding,” remarked Joshua Titus, CEO and Founder Gozio Health. Gozio Health transforms indoor navigation and significantly improves patient experience with an experiential wayfinding platform specifically designed for hospitals and healthcare systems. Gozio’s feature-rich, mobile platform revolutionizes patient engagement and not only puts patients and visitors on the best path to their destination, it gives the provider organization an important pathway to the patient. Gozio’s platform optimizes the patient journey beyond wayfinding with API integrations of EHR, urgent care and emergency department wait times, Save My Spot scheduling for urgent care, virtual visits, and more. In addition to numerous industry awards, the wayfinding solution from Gozio has earned the exclusive endorsement of the American Hospital Association. For more information, visit www.goziohealth.com or find Gozio Health on Twitter and LinkedIn.